The Sennheiser HD569 is an over ear, sealed headphone. It benefits, it seems to me, from the fairly long development heritage of the HD5xx line of products. Trickle down at its best, I suppose. This all-black headphone has a masculine appeal with curvaceous but understated look. Body part are matte black accented by the blacker black of the synthetic suede of the ear pads, headband pad, and an insert of similar dead black soft material in the center of each ear capsule housing. Sennheiser branding is discrete with a logo at the center of each ear housing and the word "Sennheiser" on the top outside of the left gimbal arm. Like most all headphones in this price range, construction materials are mostly synthetic. But Sennheiser's long experience with materials shines through to my eyes and fingers. The matte black finish of the main plastic parts resists fingerprints nicely, and feel quite sturdy. The suede-like material of the headband pad and ear pads feel sumptuous. The suede ear pad material covers a very compliant memory foam and provides a good sized oval opening (72mm x 46mm) that has good depth with a little extra space behind the rear of the pad for the outer part of your pinna. Combined with an angled baffle plate these cans should be quite comfortable for those with larger ears. With a 284 gr. weight and a really nice, ergonomic fit, the comfort of the HD569 is simply superb. Size adjustment is provided by detented sliders the come out from the headband arch. Adjustment is easy and secure. Forward and back ear capsule rotation is provided by a swivel at the top of each bail arm. Up and down movement is done at the single bail arm swivel at the rear of each capsule housing. While rotation of these swivels are limited, they are ample to the task. I found the movement of these swivels easy, slightly damped, and completely noise free. No creaking here at all. Accessorization is sparse. Two cables come with the headphone: a 3 meter cable with 1/4" straight plug, and a 1.2 meter cable with one-button remote terminated in a 3.5mm straight TRRS plug. Both cables are terminated with a 2.5mm TRS plug that inserts deep into the right ear capsule housing and has a twist lock mechanism. DIY and after-market cables are likely not an option. No carry case is provided...I would have liked to see an inexpensive fabric bag in the package. All-in-all I see this headphone as a highly mature product that has significant built-in value inherited from years of development of previous and related Sennheiser products. It's rare to find a product at this price-point so surely built. Very nice. Generally, the HD569 is a fairly neutral headphone. Bass response has a modest boost giving it good weight, but extension into the lowest octave is a bit lacking and bass is mildly distorted leading to a bit of confusion and slightly lacking textural resolve compared to best in class. However, the problems are modest, and the tastefull bass level and lack of intrusion on the mids delivers a satisfying listening experience. Midrange response is nicely smooth and integrated, and delivers a better sense of a coherent whole than most sealed cans. I hear a slight imbalance emphasizing 500Hz-1kHz a bit more than 1kHz-3kHz making vocal fundamental tones a bit stronger than their overtones, which I hear as a slight warmth and veil to voices. I'll emphasize this is slight, and I don't hear these as veiled in a significant way...but it's there. Treble is a bit low in level, but only a bit. Resolve is modestly hazy and papery sounding. While I didn't find this a tonal issue, it did appear to significantly reduce depth of imagewhich is quite wide but not very deep, and tends to reside high in the head. Dynamic punch is quite good. I didn't hear any compression to the sound. The slightly soft bass response seems to be the limiting factor here. The natural headphone to compare the HD569 with is the Audio Technica ATH-M50x as it's currently on the Wall of Fame near this price-point. In terms of esthetics, comfort, and build quality it's a no-brainer, the Sennheiser HD569 is easily superior. Sound quality is a closer call and a bit of a mixed bag. Bass response is tighter, more resolving, and better extended with the M50x. Treble resolution is likewise better with a clearer character and better image depth. But the presence region on the M50x seems a bit over-emphatic and can be more forward than the HD569. On the whole I hear the M50x as a bit disjointed compared to the Sennheiser, which seems to deliver the whole of the music in a more intact manner. The HD569 sound more like an open headphone than the M50x. Given the fact that the M50x is now $50 less than the HD569 I tend to feel the price/performance ratio of the two headphones about the same. Pinched for money, the M50x is a good buy; if you can make the leap, the HD569 is the better headphone. The Sennheiser HD569 is a solid performer delivering value on all fronts. Budget minded audiophiles, social media producers, and audio pros looking for a solid performing affordable sealed headphone won't be disappointed. It won't knock the $50 less expensive Audio Technica ATH-M50x off the Wall of Fame, but it will edge its way onto the Wall given its similar price/performance ratio, and commensurately better performance in all areas. Nice to see cheaper headphones on the wall. Great that they give the revered M50x a run for their money. I wonder if this headphone could be improved with modding. Specifically, I wonder if something could be done to damp that ringing. Could be a fun project for the modding community. Also, looking at the graph, the HD 569 appears to come closer to the general response curve of the HD 600 than closed headphones typically do, particularly in this price range. I'm not expecting the same coherence or refinement, of course, but just in terms of overall tonality, how close is the HD 569 to the HD 600? It's worth noting that the HD 569 to my knowledge is identical to the HD 598 Cs. The specs are the same, but the 569 has velour cups and a velour headband, while the 598 closed has a cheaper, less comfortable cushioning, and a tighter fit on the skull. Also, the 598 cs midrange is not as smooth as the 569, a bit more nasal sounding. I have the 598 cs and the 598 open, and my wife and I like the bass better on the 598 closed. But over all, we think the 598 open has the higher end, more open sound and the one we would most likely choose for movies, youtube, and classical and jazz. We would probably choose the 598 closed for pop music. Same disgusting mid bass hump as M50X, same pit in lower treble. A bit less upper mids. Weird 3.5khz spike? No thanks. Did you make those graphs yourself? How did you apply the Harman curve? Yea I did, I wrote a program that let's me do it. 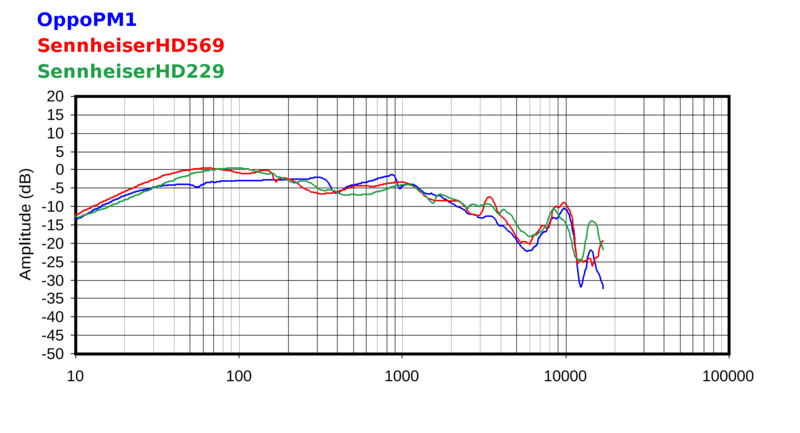 The current Harman headphone target (blue curve on first graph) is Harman's PIRL, plus the dashed green curve on the first graph. 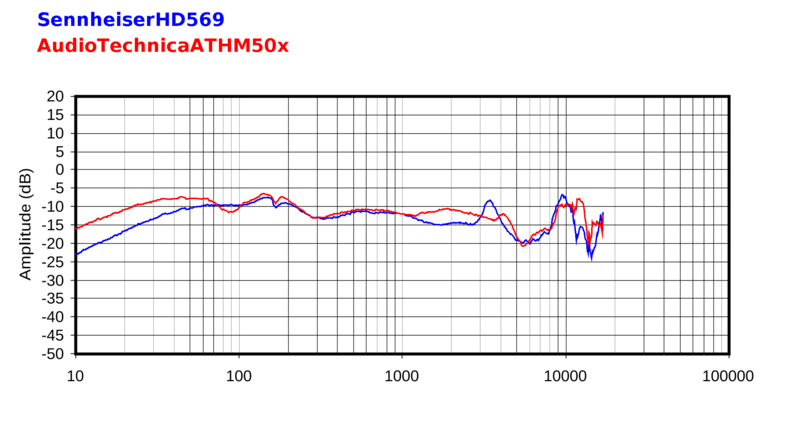 The dashed green curve is an in-ear measurement of loudspeakers calibrated to a _flat_ in-room response. And that in-ear measurement was performed with a G.R.A.S. head & torso simulator. I believe he even changed it a bit, elevating 5-20khz? Anyway, I lifted the compensation from his measurements and applied them to other measurements. The modified Harman plot may be closer to neutral than IF's regular Independent of Direction compensated plots. But I'd still take some of the results (esp. in the treble) with a grain of salt, because Tyll's modified curve is also based to some degree on the G.R.A.S. measurements. Would you be interested in trying some other compensation curves? Sure, I also lifted the DF curve. If you want, join the Discord, and we can have a chat. It's a bit easier than doing it here. Thanks for the invite. I'll consider it. The headphones in this sampling were generally a bit on the bright side imo. So a "neutral" headphone will probably have a slight downward tilt overall toward the treble, compared to this graph. A little overshoot in the lower bass is probably also ok, for better extension. There are also some slight discrepancies in the treble between the B&K, and Head Acoustics system (used by IF), which may cause some "waviness" in that region on the compensated plots. This is all I've got though at the moment from my own work. Amplitude range (vert. axis) is 50 dBs on both graphs. Frequency range is the usual 20 Hz to 20 kHz logged. Do you have a list of the 20 headphones? I do! And it was actually _21_ headphones, rather than 20! : ) (Guess my memory was a little fuzzy.) And both the left and right channels were used, which makes a total of 42 samples all together. These are the headphones in the sampling: AKG K812, Audeze LCD-3, Audeze LCD-X, AudioTechnica M50X, Beats Solo2, Beyerdynamic DT-880, Beyerdynamic T1, Bowers & Wilkins P7, Denon D5000, Focal Spirit Professional, Grado SR-325i, HiFiMan HE-500, KEF M500, Philips Fidelio F1, Philips Fidelio X1, Philips Fidelio X2, Sennheiser PX100-II, Sennheiser HD-800, Shure SRH-1540, Sony MDR-MA900, and Sony MDR-Z7. Tha raw B&K measurement data came from the Korean Golden Ears website. When I made the above graphs, GE did not have plots for some of the more popular Wall-of-Famers here, like the Oppos, NAD HP50, or Senn HD600. So I had to make due with the best I could find in their database. I tried to strike a good balance between brighter, and bassier HPs. Imo though, the graph favors the brighter audiophile cans a little, because there were simply more of those to choose from. Interesting. What do you want to use this curve for exactly? ...is what I was thinkin. You could try using the average curve to compensate Tyll's raw frequency response data, in place of his modified Harman curve. I think I may have some better curves for this purpose in the near future though. Tyll hasn't given me any data, I extracted the pixels from all of his graphs and converted that into my own data, so I'm able to redraw it. Yes, you can use it as a compensation, but what would the goal of the compensation be? I have a better idea, that won't require the use of the raw FR info. I can create a different correction curve that can be applied _directly_ to the compensated plots, which will undo the existing Independent of Direction compensation, and apply a new compensation function (based on the 21-headphone curve, or whatever other curve I like) in a single step. ...And an equally messy curve will be needed to undo it. I think this would be easier than trying to work with the raw graphs though. I'll also have to perform some tests of my own to make sure the new "de-compensation/re-compensation" curve works correctly. And all of the above could take some time. what would the goal of the compensation be? It would simply compare the headphone's frequency response to the average response of a variety of other reasonably good headphones. Nothing more, nothing less. How were you able to create the Harman plot of the Senn HD569, btw, if you don't already know how to use Tyll's raw plots, or how to de-compensate his compensated plots? I simply compared Tyll's ID compensated plots to his harman compensated plots. From that I derived the compensation. Yes, it would compare it to the average frequency, but what can you use that information for? I don't understand. Harman is preference target curve, so there's some meaning to it. Compared to the Hd599 and Mdr1r? 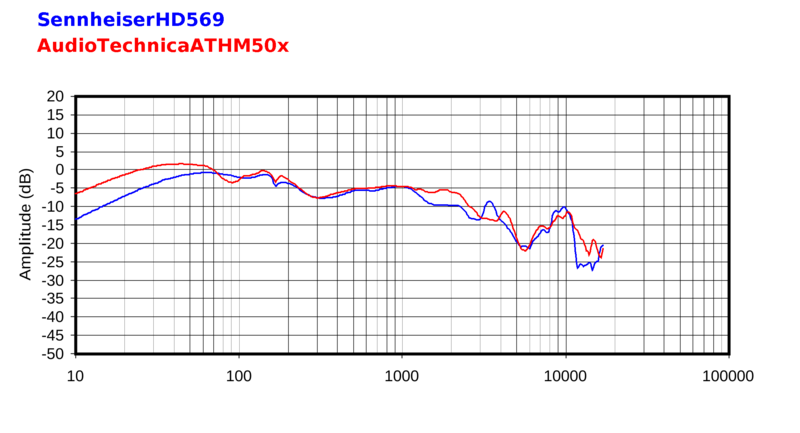 Hi Tyll, can you please tell the differences (timbrically) between the hd569 and my (beloved) hd599 and Sony Mdr1r. I have also the HD 600, 700 and 800, but I still love the sound of the cheaper siblings and the sound of the Mdr1r for closed applications. I wonder if the Hd569 can improve my "closed" listenings towards a more "openish" sound. Thanks Tyll for the great review and heads up...these cans were off my radar. Sennheiser continues to impress across the spectrum from low cost to high cost, from in ear to on ear to over ear, from open to closed. The one challenge is that they have SO many offerings that its difficult to figure out which are the cream o the crop. That being said, i think they have way more HITS than MISSES and i never regret grabbing a pair of them for music, movies, or spoken word. What is the difference between the 559, 569, 579, and 599. And why is there no 589? Sennheiser confuse the customer. Thanks for this review, Tyll. I'm gonna try to stick it out with AKGs awhile longer (even though the earpads are now completely thrashed, and have to be replaced). But reviews of other HPs in this price range are _very_ welcome and helpful. So keep em comin dude! 598cs: Leather headband with weaker cushioning integrated which will eventually wore off with the entire part. 569: Flexible plastic headband with softer cushioning attached which will be replaceable. In addition, HD5 series weigh almost 280g, so the cushioning is essential in my opinion. The sound is well-balanced with a little forward mid making the vocal sounds in your face. The bass is only there, so this is definitely not for the bass heads. I really am loving this headphone over m50x, dt770pro, srh840, mdr1a, and qc25. The sound quality is of course not perfect, but it's ridiculously comfortable even for the big head listener with the glasses like me. Thank you for the review and measurement!! By the way, better look elsewhere if you want something for outdoor uses. It's not foldable and there's no carrying pouch or anything in the box. I'd love to see you do a measurement/review of the RBH HP-2. They're beryllium dynamic closed back cans from an American company with no apparently marketing budget whatsoever. They sound great, MSRP $250, but are on sale on their website for $139. In the end I've purchased the Hd569, and it's really a great headphones. I think it's timbrically better than the Hd599. A really great achievement for a cheap closed headphone. Very good soundstage too! Thanks Tyll for bringing this headphone to our attention. In Europe is cheaper than m50x. That is a very good deal. Order placed! I have also the m50x but I prefer the Sennheiser hd25 overall. The review does not sound too enthusiastic, anyway, it makes the Wall Of Fame, LOL. I can hear the slightly muffled vocals, It's apparent compared to hd600 and hd25. Also for the small soundstage depth, I think the backward angled drivers push it a bit back. This can sound very very good for the price. I want to see if things change a bit with burn-in. Are replacement pads available for these? I've noticed 598 pads available but since these use a memory foam inside, I am concerned that it may impact sound quality if I use those pads.